Doha, Qatar – February 14, 2018 – The only way to know the truth is to see it with your own eyes. That is what Julia Leeb, a filmmaker and photographer, shared with a roomful of media and communication students, along with faculty, and staff from Northwestern University in Qatar (NU-Q). Leeb also produces virtual reality and 360-degree content about remote regions, including Transnistria in Moldova, and the Nuba Mountains in Sudan. In 2014, the photographs from her visits to North Korea were published in her book North Korea: Anonymous Country. On choosing her stories and news angles, Leeb says that she stays away from sensational news and chooses to cover undocumented stories that give viewers a real taste of how people live their daily lives. This, she said, makes her projects unique and her stories effective. During a question and answer period, students asked about the challenges she faced as a woman in hostile environments and as an outsider trying to connect with complete strangers. 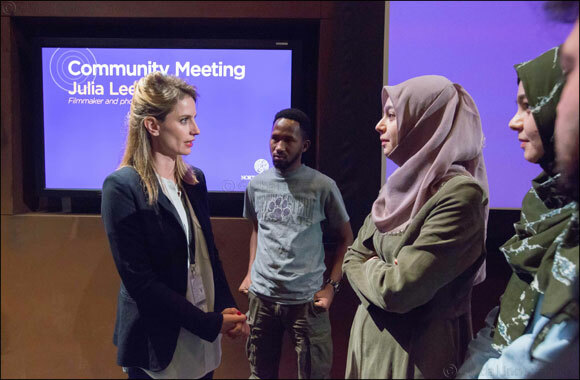 During her visit to NU-Q, Leeb also attended classes to discuss content creation and innovation, as well as share some of her personal experiences and what she has learned traveling the world, and screened some of her films. Elle magazine listed Leeb as one of the top 80 international characters and Refinery29 named her as one of the most inspiring women in Germany.